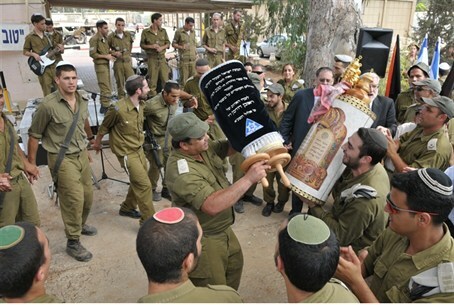 A restored Torah scroll from the Holocaust was donated to an IDF base near Tel Aviv. It is the 200th scroll donated to the IDF. The National Council of Young Israel and the International Young Israel Movement’s Israel region dedicated on Thursday a restored scroll at the Sirkin army base near Petach Tikvah, immediately north of Tel Aviv. The Torah scroll is the 200th scroll to be donated to the IDF and the first one in the Young Israel donation program that was saved from the Holocaust. It was dedicated in memory of Ruby Davidman, who played a key role in launching the “Redeem a Sefer Torah Campaign,” which provides Israeli soldiers with Torah scrolls to enrich their spiritual lives and motivation. The ceremony was particularly moving because of the fact that the grandson of the late Ruby Davidman in whose memory the scroll was dedicated, was there and in fact serves in the base to which the scroll was donated.